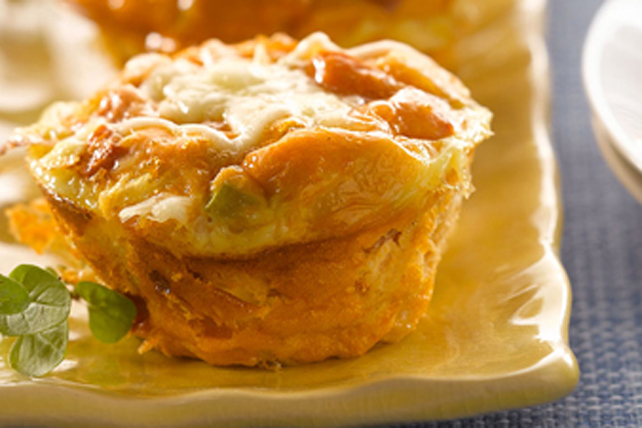 Frittatas taste great any time of day, whether morning, noon or night. Here, they're baked in muffin cups for perfect portion control. For a special touch, garnish with fresh oregano before serving. Spray 12-cup muffin pan with cooking spray; place prepared pan in oven to heat. Meanwhile, whisk eggs, ketchup, oregano and garlic in medium bowl until blended. Add vegetables; mix well. Remove muffin pan from oven. Spoon egg mixture into prepared cups. Bake 15 min. or until knife inserted in centres comes out clean. Sprinkle with cheese; bake 2 to 3 min. or until melted. Prepare using 1 tsp. dried oregano leaves. Add 1/2 cup chopped cooked ham to the egg mixture before spooning into prepared muffin cups and baking as directed.